Warner Home Video’s big release this month is Dunkirk – on Blu-ray Disc December 19th, 2017. Christopher Nolan wrote, directed, and co-produced this war movie that is about the Dunkirk evacuation in World War II. The movie features a cast of largely unknown actors, along with Kenneth Branagh, Cillian Murphy, and Tom Hardy. Dunkirk has very little dialogue – instead it creates suspense from cinematography and music. The movie opens in 1940 during the fall of France, where hundreds of thousands of Allied soldiers have retreated to Dunkirk. A young British private, the sole survivor of a German ambush, heads to the beach, where he finds thousands of troops awaiting evacuation. Meanwhile, the Royal Navy requisitions civilian vessels that are small enough to get close to the beach. In Weymouth, Mr. Dawson and his son Peter set out on his boat Moonstone as part of the attempted rescue effort. In the air, three Spitfires head towards France to try to protect the evacuation from the German Luftwaffe. After their leader is shot down, a pilot named Farrier assumes command, choosing to continue on, despite having a shattered fuel gauge. Together these stories intertwine, as the movie recounts the events of the Dunkirk evacuation. Dunkirk is a fascinating and thrilling war movie that is salient for a number of reasons. Contrary to the typical Hollywood productions, Dunkirk doesn’t highlight a single hero’s exploits. Rather it follows the joint efforts of an ensemble of characters who each play their part in the evacuation. Relatively unknown actors are largely cast, with just a few big names sharing the screen time. All in all Dunkirk is an excellent movie that draws you in and keeps the tension throughout it’s relatively short one and three quarter hours run-time. The film makers constantly find new and better ways to involve the audience in the film, and the use of large format cameras and mostly practical effects goes a long way in Dunkirk. Certainly Dunkirk is a must see / must own movie for Christopher Nolan fans and war film enthusiasts. The cast includes Fionn Whitehead, Tom Glynn-Carney, Jack Lowden, Tom Hardy, Harry Styles, Aneurin Barnard, James D’Arcy, Barry Keoghan, Cillian Murphy and Kenneth Branagh. Dunkirk was directed by Christopher Nolan, who also helmed Memento, The Prestige, Insomnia, Following, Inception, Interstellar, Batman Begins, The Dark Knight, and The Dark Knight Rises. The critical response to the movie was very positive, with a Rotten Tomatoes score of 92%, and an IMDb score of 8.2/10. Dunkirk was also a big success in the cinema, taking in $188.4M at the US box office. Taking $525 million worldwide, it is the highest-grossing World War II film of all time. The film received eight nominations at the 23rd Critics’ Choice Awards and three at the 75th Golden Globe Awards. The video on the disc is an AVC 1080p encode at 33.5 Mbps, and is presented in its original aspect ratios of 2.20:1 and 1.78:1. Cinematographer Hoyte van Hoytema shot the film on IMAX 65 mm and 65 mm large-format film stock. As such we get to see some excellent images throughout on this Blu-ray transfer. With solid images and extensive contrast, one can only imagine that this movie would be a great choice for 4K Ultra HD with HDR. Check out the details page for Dunkirk to see full resolution PNG screen captures taken directly from the disc. The main audio is lossless 5.1 DTS-HD Master Audio with 16-bits resolution at 48 kHz. While it is perhaps surprising that the release lacks Atmos audio, there was no Atmos in the Dolby Cinema theatrical release either, implying that Nolan is not a fan. The disc is a dual layer BD50, with 32.2 GB used and is coded for All Regions. The extensive supplemental features are on a second Blu-ray Disc in the set, which has the featurettes grouped into five categories, three of which mimic the nature of the film. The categories are Creation, Land, Air, Sea and Conclusion. This segment delves into the real history of the Dunkirk evacuation, including how it came to pass and first hand accounts of what it was really like on the beach. Living veterans of the evacuation were interviewed to get an authentic understanding of the historic event. The Dunkirk beach location is studied, and ultimately the real location was chosen for the shoot. This of course lent a great authenticity to the movie. The film makers discuss using large format cameras and IMAX for Dunkirk. Needless to say that there were challenges associated with the size and weight of the large format cameras. As is the ‘Nolan way’, as much as possible the action was captured in camera, with real planes and ships in the real ocean. The actors found that this approach makes their job so much easier, with practical elements to react to. A key location for the movie is the Mole, a kilometer long break-water and pier that the larger ships needed in order to dock. Since the original Mole has changed over the last 75 years, the location needed to be rebuilt for the movie, based on the original blue-prints. Casting actors and extras of the same age as the real soldiers was key to the production. Many were unknown actors who were relatively inexperienced, and didn’t have to act surprised very often. Old school techniques were used to replicate the soldiers for the wide vista scenes. The costume design and wardrobe for the movie needed to be authentic, with a realistic approach taken as much as possible. The costume department aged the clothing to make them appear to be battle weary. At times the assistant directors and other crew were camouflaged as soldiers and were in shot for the wide scenes. The enormous challenges of getting the planes together and shooting the aerial scenes is covered here. Mounting the IMAX camera on the plane was a major challenge. Many different mounts were used to set up the different perspectives needed for the film. Obtaining authentic cockpit shots was a key challenge for the movie. A Yak aircraft modified to appear to be a Spitfire was used to get in camera cockpit shots with the actors. Additionally some shots were created on a set, but with authentic backgrounds and lighting. Getting the fleet together was another huge challenge – especially the larger warships that can no longer head to sea. A full size destroyer was found, but also half scale ships were used to create the effect of larger fleet. The hero boat for the movie was key and the film makers found a suitable boat in Scotland. Modifications were needed and a lot of set dressing went in to make it feel homely. A limited camera crew were on the boat to get the essential shots in the real environment. Contrary to the standard method with a big tank and green screen, Nolan wanted to shoot the scenes actually out at sea. With water movies traditionally being ‘money pits’, the team wanted to get it right without blowing the budget. The team came up with a robust boat mounted camera crane with built-in stabilization. Some shots were too challenging to do in Dunkirk, and an inland sea in Holland was a good substitute. Again authenticity and accuracy was the goal for the destruction of the ships in the movie. On occasion though, matching sets in a tank were needed to maintain safety and controllability. Some of the original ‘little ships’ from the Dunkirk evacuation where used in the movie. Here we get an introduction to a number of the ships that still exist and are seaworthy. Nolan and the other film makers discuss their methods to maintain tension throughout the film. This included the music and score, as well as the visual story and editing. The film crew weighs in on the community of the team during the challenging shoot. There is also discussion with the veterans of what Dunkirk Spirit meant to them. Additionally there is a short segment discussing the US Coast Guard and their contribution to the film. 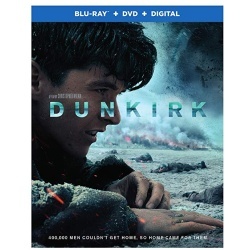 So with over and hour and a half of extras, this Blu-ray release of Dunkirk exceeds expectations for fans of the film. This release includes a DVD Copy for legacy players and a Digital Code for a Movies Anywhere Digital Copy. Dunkirk is an exceptional movie from renown auteur Christopher Nolan that I can highly recommend. The Blu-ray Disc release from Warner Home Video is technically excellent and features an extensive collection of extras. Dunkirk opens as hundreds of thousands of British and Allied troops are surrounded by enemy . Trapped on the beach with their backs to the sea, they face an impossible situation as the enemy closes in. This entry was posted on Sunday, December 31st, 2017 at 4:27 pm	and is filed under Action, Blu-ray, Commentary, Drama, History, Thriller, War, Warner. You can follow any responses to this entry through the RSS 2.0 feed. You can skip to the end and leave a response. Pinging is currently not allowed.